Lead Ore: A leading example of an ore.
Lead, however, is a metal that differs a lot from iron, being very dense, corrosion-proof, and soft. All of which result in it being quite different from iron, as far as in-game uses go. Lead Ore: Lead Ore spawns in the Overworld. It somewhat resembles Galena. Lead ore requires at least a stone pickaxe to mine, making it similar to iron ore in this regard. In the Overworld, lead ore spawns below Y=32, often, but not always,directly adjacent to Gold veins. Typically, it spawns in veins of 6-12, and is more common than gold, but less than iron. It can also spawn in the Surface layer of Extreme Hills, where it's almost as common as coal. Lead Ore has to be smelted into a Lead Ingot. Recycling: Lead has the unique property that all lead items (Except for nuggets, ingots and blocks) can be placed in a Fireplace, melting them down into a corresponding number of lead nuggets. Inorganic materials (Such as Redstone, Iron, Cobblestone...) are recovered, and organic materials (Such as wood and leather) are lost. It can be found while fishing, with lead nuggets appearing as "Junk", while Lead ingots appear as "Treasure", as a nod to lead's usage as ballast and fishing net sinkers. Found in Shipwreck and dungeon chests. Lead Darts are a rather interesting weapon, in that they're the only serious thrown weapon in the game, barring potions. Unlike bows and crossbows, charging them before launching them doesn't slow the player down, making them the most mobile ranged weapon. However, they pay for that in their inability to be enchanted, and in a low stack size of just 16. They deal 6 damage, which is on par with Iron Swords, and are fired at a rate of 3/2 per second. They don't have knockback, and they wil travel about 15 blocks when fired paralell to a flat plane. They have to be fully charged before throwing them, and are fired automatically, effectively making them the spiritual sucessor of the Beta bow. Unlike pretty much every other lead item, salvaging them requires placing 4 Darts in the campfire, and placing less than 4 will leave them there without changing at all. Lead Darts are also obtainable by killing Wither Skeletons, which now always spawn with 10-16 of them in their off-hand, making them both the only mobs wiht limited ammo in the game and the only mobs with both melee and ranged attacks apart from Blazes. Their darts are only dropped if they're killed before depleting their darts. Additionally, they're sold by Fletchers at 12-16 Darts per Emerald as a Tier 3 trade. Slings are the exact opposite of crossbows: They are cheap, but their ammo is expensive. They're also the least mobile ranged weapon, and they hurt. A lot. Slings are used by right-clicking, which causes the sling to swing, using a 2D animation that spins progressively faster (It takes 3 seconds to reach full speed) at the off-hand's side. Releasing the RMB launches the projectile tangentially. This makes slings easily the most difficult ranged weapon to master. Walking or sprinting while swinging the sling isn't possible. Lead Bullets tend to partly ignore armor (Up to 8%) and typically deal a lot of damage, particularly if they were shot from a sling swinging at full speed (At maximum velocity, they deal 20 damage, letting them 1-hit kill most common mobs). They have a chance to be dropped back as an item after hitting something, and always drop upon hitting entities. It's worth noting that NBT tags are saved and kept when the bullets drop back as items, letting the user use an anvil to put adequate text in their bullets. Lead Shot is a bit similar to Lead Bullets, but, instead of shooting a single bullet, it shoots 4 smaller bullets in a spread-like pattern. While their maximum damage of each projectile is just 8 damage and they lose momentum more quickly than Lead Bullets, they have the ability to inherently hit several targets at once, and will ignore each other's invincibility frames if several connect with the same target. Both slings and their bullets can now be sold by Weaponsmiths as tier 2 trades. Additionally, a quarter of all Zombie Pigmen now spawn as Slingers, who will use Slingers and prioritize staying out of the Player's reach. Their bullets, unlike the player's, will whistle, making a "zip" noise, allowing players to avoid them. Slinger ZPs have a change to drop up to 5 Lead Bullets. Mass (I-V): Increases damage by [Base Damage/2]*(W+1), with W being the enchantment level. This means that a Mass V Sling can deal 80 damage per hit with Lead Bullets, and 32 per Lead Shot projectile. Bounce (I-III): Allows lead bullets to bounce on blocks and entities after impact. This can allow they to bounce into places other ranged weapons would be unable to reach, and to hit several mobs at once. Void Bullet (I): Causes projectiles thrown by Slings to not be affected by gravity until they completely lose their velocity, at which point they fall. It's only found as a Treasure Enchentment. Shatter (I-IV): Transfers any overkill damage dealt on a lead bullet's recipient to any entities within a 4-block radius, excepting passive and tamed mobs. This precludes lead bullets dropping as items. The total damage transferred is DW/4, with D being the Overkill damage, and W being the enchantment's level. Armor Piercing (I-III): Ignores 20% Armor per level. At level III, lead bullets ignore 68% armor. Not compatible with Power. Their obvious use is to move liquids (Both from place to place and manipulate them. Pipes are smaller than blocks, and are also directional. They use a texture that allows Pipe blocks to have up to 6 connections through which fluids pass from outside of pipes, and from pipes to pipes. Individual openings can be sealed and opened by right-clicking on their respective faces. Upon placing the Pipe Block, it will always have all of it's faces "closed", looking like a small floating cube, which then requires right-clicking in order to connect it. If a Pipe Block is right-clicked while holding a Pipe Block, it will automatically place the pipe in the inventory, and connect both pipe blocks on top of opening the opposite face of the placed pipe block, making the construction of pipe networks more convenient. Otherwise, pipe blocks placed next to each other DO NOT connect unless the corresponding side of both is right-clicked. Pipe blocks can be moved by Pistons, which actually preserves the liquid in them. If the input pipe block meets a paralell fluid flow, the fluid will be moved through the pipe at twice it's normal flow speed, coming out of the other end of the pipe. If there's multiple ends, it will distribute the flowing blocks among them (Example: A lava source block connected to 3 pipe ends will produce 3 Flowing Lava blocks, all of which will act as if they were 2 blocks away from their source block), with the "equivalent distance" being X/Y, with X being the distance the flowing fluid block would be from it's source at the input pipe's position, and Y being the number of output pipes. Flow strength isn't lost in pipes. Fluids cannot move vertically upwards unless every other path is sealed, and will prefer to flow vertically downwards over flowing horizontally. If a dropped item in the water comes into contact with a pipe block, it will move at twice it's normal speed in the fluid, and will "roll" for a random path in intersections until it comes out thorugh an open pipe, allowing for the movement of items through pipes in ways that hopper "pipes" don't allow (Hoppers still retain the ability to offload their items into containers, and take items from other blocks and from dry places). Redstone Comparators can detect fluids in pipes, with the amount of fluid directing the strength of the signal, with source blocks being the strongest (15) and the furthest possible flowing liquid block being the weakest(1), and every other flowing block strength being at roughly even intervals within those values. Filters selectively allow for the movement of items within liquids that pass through them. They have a GUI with two rows of items: A 5-square "Blacklist" grid of items not allowed to pass through the filter, in which you have to place the corresponding item (ei, putting coal in the blacklist will allow flow of all items BUT coal), and a 10-square "Storage" grid that stores items that haven't been allowed to pass through the fluid, and which can interact with Hoppers. Pumps allow the movement of fluid source blocks through pipes. They have two sides: An Input side, and an opposite Output side. They also allow fluids to move upwards, which is stopped if the pipe meets a horizontal pipe block. When activated by Redstone, any continuous source blocks (That is, directly touching the pipe, or connected only by liquid source blocks to the input pipes) within a cylinder of a 16-block radius at or above the Y-coordinate of any open pipes in the Input Side will gradually replace air blocks directly touching the output pipe within a 16-block radius cylinder BELOW or at the Y-coordinate of the corresponding output pipes. While the input and output are draining, flowing liquid blocks aren't allowed to spawn within the cylinders (In no small part so draining water bodies is actually possible). If there's either several inputs or several outputs, all ends will work at the same time, but at reduced speed each, and source blocks will respectively be removed and added to the highest and lowest points of the cylinder first. Valves are basically pipes that can be toggled on and off, allowing for control of fluid flow within the pipes. If they're placed between 4 perpendicular pipe blocks, then they'll be both open and closed to the perpendicular flows so they'd be open to one direction and closed in the other. Sprinklers spawn rainfall-like liquid particles if a pipe block brings liquid to them and it's activated by Redstone, which provide similar effects as rain, in the case of water, and deal damage and burn flammable blocks, in the case of lava. They're dispersed so that the effect radius is directly proportional to the altitude between the sprinkler and the affected surface. Nozzles require receiving fluid blocks from a pump to work and also has to be activated by Redstone, and shoot an arcing jet of liquid that can damage entities and break any blocks that a Wooden Pickaxe can break, causing it to always drop. As the jet travels, it loses strength, and, below a certain threshold, it loses the ability to break blocks and deal damage, but can still affect other blocks similarly to it's parent liquids. It's range is more or less the same as a bow's, and, approximately speaking, it loses it's ability to break blocks more or less when a bow's arrows would deal less than 4 damage in the same flight path, and the time required to break a block is lower the stronger the jet of liquid. This is a pretty straightforward one. Right-clicking a Pipe with Redstone Dust turns it into a "Sheathed Redstone Wire", or SRW for short. They break down into their components upon breaking them. SRWs use a 3D model with hollow squares in the sides showing it's Redstone charge. They follow the same placement and directional rules as Pipes (In other words, they're basically pipes that transmit Redstone charge instead of liquids). Unlike Redstone Wire, they can be waterlogged and contact fluids without any trouble, making them basically waterproof Redstone Wire. Another trait they have is that they can be limitlessly placed vertically, thus avoiding the unsightly redstone staircases (Apart from platforms for repeaters) and saving horizontal space. They have to have an open face directly touching Redstone mechanisms in order to interact with them. This allows them to both be quite precise, beyond what redstone wire allows, and to connect in ways that wouldn't be possible with normal Redstone Wire. Additionally, SRWs can be moved by Pistons without breaking, althrough they'll lose their charge if they already had it. Effect Ingredient: If brewed into a Thick Potion (Making them the first potion to do so), Lead Nuggets will produce a Potion of Inversion. Potions of Inversion will invert the effects of other status effects that are applied on an entity affected by Inversion. For instance, Poison I is turned into Healing I. Any effects that used to not have an opposing effect (Such as Fire Resistance and Water Breathing) will now gain inverse effects, which are also available by using Fermented Spider Eyes to corrupt their respective potions. Any effects that were previously applied BEFORE applying Inversion WILL BE modified (So be careful to use them, lest you turn an Enchanted Golden Apple into something worse than a Pufferfish). It's worth noting that Enchanted Golden Apples and Golden Carrots are specifically provided a new potion effect that shields their other effects from this effect (After all, wasting your Enchanted Golden Apple in SMP thanks to a common ore would probably produce a continent's worth of salt). Another notable exception is Bad Omen, which isn't reversed. Status effects remain inverted even after the Inversion effect has worn off, and the potion's base duration if just 10 seconds. Base Ingredient: Lead Nuggets will, if added to a potion that already has effects, enhace them by adding a secondary Potion Effect that complements the original potion effect's. For instance, Potions of Slow Fall will also gain a Levitation effect, and Water Breathing also gains Night Vision. It's worth noting that, in most, the duration of the original effect is now split between both, with exceptions such as Slow Falling, in which the initial effect doesn't lose duration, but the secondary effect still has 50% of the original's duration. Jump Impairment: Lowers jumping height and ability to climb stairs and other half-blocks. Fire Vulnerability: Increases damage taken from fire, lava... Causes fireproof mobs to become vulnerable to fire and lava, causes Blazes to deal 4 damage every 10 ticks due to being apparently made of fire (Or something similar), so becoming vulnerable to fire kills them due to the oxymoronic circumstance of being damaged by what they're made of. Water Suffocation: Causes the breath meter to deplete faster. Causes aquatic mobs to drown in water. Drainage: Seals hearts from the life bar, effectively lowering maximum health for the duration of the effect. If all hearts are sealed, the affected entity will die upon taking damage. Conduit Depower: Decreases underwater mining speed and visibility. Empties the breath meter. Dolphin's Discrace: Lowers swimming speed. Slow Fall-Levitation. (Making them the only pair in both lists). Blastproof block: Lead Blocks have a blast resistance of 80, which makes them impervious to TNT, Creepers, and weaker explosins (But not to Charged Creepers), making them an alternative to Obsidian in the construction of structures that have to be TNT-proof, such as TNT Cannons in the Nether. More interestingly, they're still able to be moved by pistons and slime blocks. Lead Golems are built by placing a pumpkin on top of asideways T of lead blocks. They also spawn in Villages, but they need to fulfill the same requirements as would be needed for 2 Iron Golems to be able to spawn. Their model sort of resembles a mix of a Creeper and a Spider, scaled up to a size of 3 blocks. It has two heads: One where the "Spider's" head would be, and another where the "creeper" would have it. The torso is 2 blocks wide, and it has a right arm that is thick and long, almost reaching the floor. Lead Golems have 15 Health, and move slowly, making them quite vulnerable. However, they are capable of using ranged attacks. They can climb walls, which they will do in order to get to high places. They also have a maximum sight radius and attack range of 64 blocks, allowing them to kill things long before they get close. They're also capable of both calculating indirect fire trajectories and seeing through walls. Their first attack is used on targets that have at least 3 other targets within a 4-block radius of them, targeting the largest concentration of enemies. This attack shoots 9 whistling bullets that deal 12 damage each. Their second attack is much more powerful, but less effective on groups. This will be used on stronger entities which have at least 30 health or are at least 40 blocks away from the Golem, and has a priority over the other attack in the former case. This attack consists of launching a single Lead Bullet that deals an atrociously high 100 damage. The bullet will emit a sound, similarly to whistling bullets. However, rather than the "Zip" sounds, the noise is more similar to a Stuka scream than anything. The bullet also has higher flight speeds than normal. The Radio Emitter will, if powered by Redstone, cause all Radio Receivers to emit a Redstone Signal if within a 32-block radius. Both the Radio Emitters and Receivers can be toggled between 8 different colors, and Emitters will only affect Reveivers that are of the same color. 7/3/2019: Added clarifications. Removed shipwreck lead linings. Added sling enchantments and unique lead block properties. Redstone comparators now detect liquids in pipes. Tweaked slings and darts. Added potion effect opposites list. 8-3-2019: Added more clarifications, particularly related to redstone wiring and pipes. Modified Lead Dart recipe so it's more reflective of the actual item. 10-3-2019: Removed firing delay upon switching to a Lead Dart stack. Lowered Dart damage and limited it's range to less than a Bow. Increased Sling fire rate, and modified enchantments. Renamed "Power" to "Mass" in Slings. 16-3-2019: Heavily modified Lead Darts, both to make their recipe make actual sense, and to give them a niche without making them have too much damage. Added Lead Shot. Added Filters. Modified Pipe placement mechanics, and added Lead Golems. Added radio emitters and receivers. Made Sheathed Redstone Wires and Pipes explicitly able to be moved by Pistons. 24-3-2019: Added Sprinklers and Nozzles. Lead Ore:Lead Ore spawns in the Overworld. It somewhat resembles Cerussite. Lead ore requires at least a stone pickaxe to mine, making it similar to iron ore in this regard. In the Overworld, lead ore spawns below Y=32, often, but not always,directly adjacent to Gold veins. Typically, it spawns in veins of 6-12, and is more common than gold, but less than iron. It can also spawn in the Surface layer of Extreme Hills, where it's almost as common as coal. It can be found while fishing, with lead nuggets appearing as "Junk", while Lead ingots appear as "Treasure". Found in Shipwrecks and dungeon chests. Shipwrecks in particular also sometimes spawn Lead blocks that line the remains of the ship's hull. These may be too many ways to obtain. Lead Darts are a rather interesting weapon, in that they're the only serious thrown weapon in the game, barring potions. Unlike bows and crossbows, charging them before launching them doesn't slow the player down, making them the most mobile ranged weapon. However, they pay for that in their inability to be enchanted, and in a low stack size of just 16. They deal a similar amount of damage as arrows fired from a Power I Bow. So... arrows that are cheaper to make yet deal more damage. They don't need a bow, and can be spammed clicked? Sounds overpowered. Inventory space isn't very important compared to the buffs lead darts provide. Slings are used by right-clicking, which causes the sling to swing, using a 2D animation that spins progressively faster (It takes 5 seconds to reach full speed). Releasing the RMB launches the projectile, with the sling's position affecting the trajectory. This makes slings easily the most difficult ranged weapon to master. Sprinting while swinging the sling isn't possible. Lead Bullets tend to partly ignore armor and typically deal a lot of damage, particularly if they were shot from a sling swinging at full speed (At maximum velocity, they deal 16 damage, letting them 1-hit kill Spiders). They have a chance to be dropped back as an item after hitting something, and always drop upon hitting players. It's worth noting that NBT tags are saved and kept when the bullets drop back as items, letting the user use an anvil to put adequate text in their bullets. Both slings and their bullets can now be sold by Fletchers as tier 3 trades. This sounds more balanced than the darts, but a bit unbelievable for me. I think bows would deal damage than a slingshot, though I don't have much experience getting hit by either. Their obvious use is to move liquids (Both from place to place and manipulate them. Pipes are similar to Wood blocks in terms of placement, except that their ends can be modified if a pipe is placed perpendicularly and facing them. If placed paralell to the flow of a fluid, the fluid will be moved through the pipe, coming out of the other end of the pipe. If there's multiple ends, it will distribute the flowing blocks among them (Example: A lava source block connected to 3 pipe ends will produce 3 Flowing Lava blocks, all of which will act as if they were 2 blocks away from their source block), with the "equivalent distance" being X/Y, with X being the distance the flowing fluid block would be from it's source at the input pipe's position, and Y being the number of output pipes. Pumps allow the movement of fluid source blocks through pipes. They have two sides: An Input side, and an opposite Output side. While the input and output are draining, flow from the source blocks within both cylinders would be paralized (In no small part so draining water bodies is actually possible). If there's either several inputs or several outputs, all ends will work at the same time, but at reduced speed each, and source blocks will respectively be removed and added to the highest and lowest points of the cylinder first. This sounds unnecessary, only coming in handy with lava. Water can be made renewable. I would rather they just update lava physics to match water and let you transport liquids through a bucket. This is a pretty straightforward one. Right-clicking a Pipe with Redstone Dust turns it into a "Seathed Redstone Wire", or SRW for short. SRWs use a 3D model with points in the sides showing it's Redstone charge. Unlike Redstone Wire, they can be waterlogged and contact fluids without any trouble, making them basically waterproof Redstone Wire. Another trait they have is that they can be limitlessly placed vertically, thus avoiding the unsightly redstone staircases. They have to directly face Redstone mechanisms in order to interact with them. Their main catch is that their range is reduced to just 10 blocks, requiring more Repeaters to travel the same distance. Very useful. I think I've seen this somewhere else, but nevertheless, the concept has to make it into the game somehow. Support there. Potions of Inversion will invert the effects of other potion effects that are applied on an entity affected by Inversion. For instance, Poison I is turned into Healing I. Any effects that used to not have an opposing effect (Such as Fire Resistance and Water Breathing) will now gain inverse effects, which are also available by using Fermented Spider Eyes to corrupt their respective potions. Any effects that were previously applied BEFORE applying Inversion WILL BE modified (So be careful to use them, lest you turn an Enchanted Golden Apple into something worse than a Pufferfish). It's worth noting that Enchanted Golden Apples are specifically provided a new potion effect that shields their other effects from this effect (After all, wasting your Enchanted Golden Apple in SMP thanks to a common ore would probably produce a continent's worth of salt). I like the inverted potion itself, but am unsure how they would play as "base ingredient". Not all potions have a direct invert and those that do having them blend would be annoying. Every potion has a use for certain situations. So when you are swimming through the nether with fire resistance, you don't want your water breathing to suddenly show up with 50% original duration. When it comes to these inverted potions, what would you be trying to do besides mess around? Overall I like the concept but find the changes in ranged weapons and piping unbalanced or unnecessary. But I do approve of redstone seething and potion inversion. Partial Support. Suggestion: you mention "lead nuggets" much more than lead ingots. I suggest instead of dropping ingots, the ore drops 3-5 lead nuggets. I'll remove the lead lining from shipwrecks due to the excessive amount of lead even a single shipwreck could produce. I'll specify the fire rate of Lead Darts (15 Ticks between throws), add a delay mechanic upon switching to a Lead Dart stack before it can be launched in order to prevent continuous spam (6 seconds), and change the recipe so it uses Iron instead of a wooden plank in order to make it expensive enough to make missing more costly. As for slings, one of their real-life traits is that they hurt a lot due to blunt trauma. In-game, I want them to have more range and damage per hit than bows (As ancient slings were only surpassed at the time by composite bows in range, and a fast-moving chunk of lead is bound to hurt. A lot. ), but be difficult to prepare and more punishing of misses. Since bows themselves have a base DPS of 9, and I want slings to trade off their higher damage per hit for less damage per second, but the 3,2 DPS of slings is too low, I'm not sure if I should reduce the time it takes to reach full spinning speed to 4 seconds, or increase maximum damage to 20, both of which would give it a DPS of 4. Of course, I'll add enchantments to them. I could add a component to pipes that can detect fluids moving through them, which would allow for a way to detect liquids with Redstone, on top of opening various mechanisms to be made (Such as using pistons to remove water source blocks at the output, or quickly harvesting large amounts of lava with dispensers). As for Potions of Inversion, I'll put a table of all in-game status effects and their respective inversions, on top of any suggested inverted potion effects. As for the ore, I wanted it to be like Iron Ore. As for the amount of lead per ore, I'll add a few uses for Lead Blocks to compensate for the usage of comparatively little Lead in it's other applications. Support. 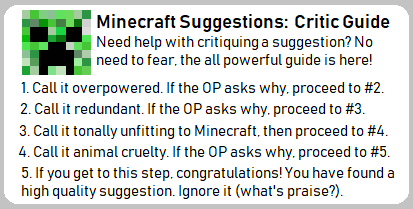 It's not everyday you find a good suggestion for another ore.
One obvious point: Why not use gold for most of these? Recycling is a good idea on its own and ought be introduced for a number of non-organics; doing so would please both the item farmers (another source to be developed) and the opposition (by lessening both the need for and size of such farms). Congratulations on making the resource renewable via both fishing and trading. Given the comparatively low spawn rates of whither skeletons, that their thrown darts cannot be retrieved seems odd…. No mention is made of whether these could be fired from dispensers. RE the crafting recipe: Lead is too soft to be used for a tip; an iron tip with a lead wrapped shaft (or carrying a ball of lead behind the head) would be more likely to penetrate [This parallels the IRL construction of a number of historical darts with wooded shafts carrying stone weights just back from the point.] This form of construction also makes the feathers superfluous as the Cp [center-of-pressure] is already rearward of the Cg [center-of-gravity] due to the mass distribution. Quite a few interesting ideas here: the aiming mechanism needs to be better explained (I am unclear how this would appear in first-person view), but maintaining the tangential to point of release trajectory [what I'm assuming is meant by "with the sling's position affecting the trajectory"]. Having a weapon that requires a significant degree of human skill to use would ceratinly be a nice addition. Your clearly doing a lot of modification to the RL weapon particularly in regard to ammunition cost: for the form of sling you're describing, rock were the most common form of ammo (ie free) [outside of organized militaries like the Romans and Egyptians]. I've known people in the historical weapons hobbies who could hit a target with a light sling while moving at speed. However, avoiding Hide behind the pillar to spin-up, Jump out & fire, Jump back sniping may mandate disallowing this in game. The form of sling you're describing is the light or hunting sling (spun reletively horizontally over one's head and having a generally flat trajectory). The heavy sling (only known uses are military, and seige and formation engagements at that) was spun vertically next to the body and launched a much heavier projectile in an indirect trajectory– both historical accounts and Egyptian carvings (which depict the light slingers in front of, but the heavy slingers behind archers) indicate that at least the latter could consistently out-range the bows of the time. Adding these also might be considered, although the accuracy issues would likely make them even more unusual to see in play. Apparent typo: You appear to have written seathing where sheathing was intended. "If placed paralell to the flow of a fluid, the fluid will be moved through the pipe, coming out of the other end of the pipe." What happens if the pipe is laid orthogonal to the liquid flow (rather than parallel)? Example: On a flat plain with a single water source, a pipe is placed facing N-S with its N end 1 block S and two blocks E of the water source. With what speed does a change in fluid inflow level/strength propigate through a pipe? How fast does fluid move through a pipe, if different from the above? The actual rate (source blocks per time unit) for pumping needs to be published; differing values could produce differing effects. As described a valve at a NSEW junction will allow only two states: NS open and EW closed OR EW open and NS closed. No mentionis made of junctions that include UP & DOWN as possible inputs/outputs: can such junctions be formed? If so, how do such behave? SRW is stated to have a maximum propigation distance of ten: what is the power decay sequence? Assuming things like blocks & hoppers & droppers react with the ends of SRW just as they do with RSD answers many questions, but this is not explicitly stated. Is the Potion of Inversion intended to effect potion or status effects (the inclusion of the golden apple suggests the latter)? Were this block to be moveable by pistons and interact 'normally' with slime blocks, it would have greater utility. Sound barrier: AFAIK, unless you intend the effect to require compeltely enclosing a source, this may require work on how sound is propagated. (I can't find a difinitive stement, but things like "The piston makes a sound that can be heard within a 31×31×31 cube centered on the activating piston." suggest that sound does not 'pathfind' to adjust its intensity/volume). Gold ore would be potentially too rare for those uses than lead and the game seems to lean on giving it magical properties. Plus, part of the suggestion's premise was proving that an ore could have several uses without even slightly touching on "Tools and armor". The concept of the darts is as a bit on an offensive counterpart of the shield, in that they're designed to be more useful in the off-hand than in the main hand, so the idea is that the player is supposed to use something else while the delay is in effect, and to compensate for their mobility. That is because the idea is to reward players for seeking to fight them in ways that prevent them from firing their darts while at the same time making it harder for their height to be exploited. I'd say they should. I'll have to add that. As the original recipe shows, they're somewhat based on Roman plumbatae, althrough I didn't realize the bit about the tip. I'll slightly change the recipe to reflect that. Actually, I simply didn't research enough. My mistake :Q I'll modify the Sling's recipe, and clarify the spinning animation, althrough I was actually thinking of the heavy slings in hindsight (The accuracy issues will be caused by the precise timing anyways). As for the enchantments, yes. They're so powerful because it has to compete with the bow, and because a Power V sling is often bound to deal several times it's target's health in damage. As for not mentioning the rocks as ammo, that's imply because couldn't think of how to make them worthwhile, as cheap ammo that lowers DPS of a weapon that already has low DPS is rather questionable. Yes to all of them, and I'll add the explanation to the OP, along with a way to prevent pipes from attaching to each other. Yes, it does. I'll have to specify that it's the input pipe block. I'd say they're the same. I'll add the propagation speed. It basically prevents the creation of flowing liquid blocks within the cylinder. They only have to be powered. They behave the same. As for placing pumps vertically, that simply would put the handle textures perpendicular to both. The SRWs' red bits would look progressively darker. Precisely that way, particularly as only 4 blocks are required in the final repeater structure, althrough there may be a need for more in order to hide the unsightly non-waterlogged SRWs. However, considering the cost of SRWs, I may up it to 15. A single horizontal block would be needed to put the repeater, but SRWs can take the shape of a right angle. Yes, those things interact similarly with redstone devices. They interact as redstone dust would. Status effects, mostly in case any new potions are added for status effects such as Absorption or Resistance. I thought that lead blocks being moved by pistons and slime blocks was implicit in the statement "Lead blocks are mostly normal ore blocks". I'd say that a simply mechanic would be that sounds would diffuse in straight lines from their source, blocked only by Lead Blocks. Responses in bold, due to the length of the questions and points. "Gold ore would be potentially too rare for those uses than lead…[/b]" An important point, although the impact is greatly reduced for persons who tend to farm for much of their resource needs; when farming is considered, my perception is that would be that lead would be rarer than gold due to the comparative ease of farming (essentially regardless of the ore occurance rates). This sounds like the intent is to enter battle with dart(s) in the left [off-]hand and a sword in the right [main], using the sword until the 10-seconds dart charge period has passed. After this, it would then be possible to mix dart attacks (by pressing 'use'/right-click) with sword attacks (by pressing 'attack'/left-click). Because "Flow strength isn't lost in pipes" (from the OP), for any flow strength that can be gotten into a pipe the same flow strength will continue to exist throughout the length (hypothetically infinite) of that pipe, with comparators anywhere along the pipe producing identical outputs. No mechanic is mentioned governing the propigation speed of changes of the flow strength at the input point along the pipe, but (even if this is finite) the result would still apply once a steady state had been achieved. Comparators can detect fluids in pipes, with the amount of fluid directing the strength of the signal, with source blocks being the strongest (15) and the furthest possible flowing liquid block being the weakest(1), and every other flowing block strength being at roughly even intervals within those values.]" "SRW is stated to have a maximum propigation distance of ten: what is the power decay sequence? The SRWs' red bits would look progressively darker. [/b]"
RSD begins at power N (15 from lever/button/repeater) and drops 1 power level for each block traveled, but the 10 block SRW maximum propigation distance is not an integral divisor of 15 and having the power drop by 1 or 2 'depending' at each new block would make these quite difficult to use unless the input power was both known and fixed. Assuming you find a maximum propigation distance of 15 too powerful (and 7 – ie drops 2 power levels per block traveled – too limiting), using the RDS 1/block decay sequence with a maximum RS power level in any SRW of 10 might be a viable solution. need for more in order to hide the unsightly non-waterlogged SRWs. [/b]However, considering the cost of SRWs, I may up it to 15. [/b]"
A single horizontal block would be needed to put the repeater, but SRWs can take the shape of a right angle. [/b]"
"I thought that lead blocks being moved by pistons and slime blocks was implicit in the statement "Lead blocks are mostly normal ore blocks". [/b]"
I actually read that as being a statment about the ore blocks, not the lead metal blocks (formed from 9 ingots). "I'd say that a simply mechanic would be that sounds would diffuse in straight lines from their source, blocked only by Lead Blocks. [/b]"
This is certainly less computationally intensive than actually pathfinding, but would still be (AFAIK) a change to the sound propigation engine [Input from someone with better technical knowledge thereof would help]. Not previously mentioned: flows can be divided; can they also be combined? "Gold ore would be potentially too rare for those uses than lead…" An important point, although the impact is greatly reduced for persons who tend to farm for much of their resource needs; when farming is considered, my perception is that would be that lead would be rarer than gold due to the comparative ease of farming (essentially regardless of the ore occurance rates). The SRWs' red bits would look progressively darker." need for more in order to hide the unsightly non-waterlogged SRWs. However, considering the cost of SRWs, I may up it to 15." A single horizontal block would be needed to put the repeater, but SRWs can take the shape of a right angle." "I thought that lead blocks being moved by pistons and slime blocks was implicit in the statement "Lead blocks are mostly normal ore blocks"." "I'd say that a simply mechanic would be that sounds would diffuse in straight lines from their source, blocked only by Lead Blocks." Lead would likely still stay cheaper than gold, except in the case of complex farms, due to the recycling mechanic, which doesn't just make Wither Skeletons a renewable source of it (And iron, incidentally), but also causes Lead Bullets to be a source of lead, althrough I should have specified a prize for them in the first place. I'd also have to modify how lead is found by fishing. How you described using darts is practically how I envisioned them. As for changes in flow strength, I meant to say that it wasn't changed from the input and output. I'll have to reword it. As for redstone signal strength from pipes, I'd have even numbers relate to flowing water blocks, and odd numbers related to lava flowing blocks. That way, it'd be possible to detect them differently. I meant to say that I'd make SRWs transmit the Redstone Signal through a distance of 15 blocks, like normal Redstone Wire. Yes, the jog would be needed. Althrough I have the impression that's still very much preferable to the bulky staircases. As for combining flows, I didn't consider that, but, since it's nor exactly a difficult proposition, I'd say yes, as long as they're the same fluid. They substeact if they're fluids that react with each other (Read: Water and lava). Because of this, I'm going to skip over the intro. I like the idea of using the campfire for smelting with multiple outputs. Seems interesting, it's also a nice renewable source for Skyblock. Seems like an interesting idea, although I don't think they should deal so much damage. Full charge on a Power I bow can deal a scary 7.5 hearts of damage, and combined with the ability to charge in and retreat so quickly, it seems like you could easily wipe out enemies using darts without much effort at all. I think they should have lower damage in addition to the other nerfs. Okay never mind, I didn't read this... 10 seconds is waaay too long to wait to throw some darts. If I was trying to sneakily get someone maybe I'd have time to throw these, but in any other situation this is far too long. The DPS is still pretty high though. 14 damage per 0.75 seconds may not be as much DPS as a sword, but you have the ability to walk away from your opponent semi-fast in that 0.75 seconds. Lead Darts are also obtainable by killing Wither Skeletons, which now always spawn with 3-5 of them in their off-hand, making them both the only mobs wiht limited ammo in the game and the only mobs with both melee and ranged attacks apart from Blazes. Their darts are only dropped if they're killed before depleting their darts. Considering Withers give you Wither with every attack, this seems a bit overpowered. Slings are used by right-clicking, which causes the sling to swing, using a 2D animation that spins progressively faster (It takes 5 seconds to reach full speed) at the off-hand's side. Releasing the RMB launches the projectile tangentially. This makes slings easily the most difficult ranged weapon to master. Walking or sprinting while swinging the sling isn't possible. Seems interesting, because the skill required actually offsets the damage. I like this better than the dart. On one hand I think 1-hit killing a player seems a bit overpowered, on the other hand a smart player might find ways to avoid the sling as opposed to a mob. Seems appropriate, I'd be interested in what they cost in terms of emeralds, though. Power (I-V): Increases damage by Wx50%, with W being the enchantment level. This means that a Power V Sling can 1-hit kill an Iron Golem. This seems pretty overpowered, to the point that I assume this isn't what you meant. Granted, it's pretty hard to hit either of these targets with the sling, but if you could, you'd be able to take down the bosses way too easily using this. Plus, the Iron Golems mentioned aren't as hard to hit. Besides that, I think it'd make more sense to change the name to "Momentum", considering this version of Power doesn't actually work the same as the bow's version of Power. Seems interesting, but I feel like the damage should be heavily reduced for each bounce if it isn't nerfed from its current value. Void Bullet (I): Causes projectiles thrown by Slings to not be affected by gravity until they completely lose their velocity, at which point they fall. Interesting, but this could throw off your ability to shoot if you got this enchantment on accident. I think it'd be best if this was a treasure enchantment. Shatter (I): Transfers any overkill damage dealt on a lead bullet's recipient to any entities within a 4-block radius, excepting passive and tamed mobs. This precludes lead bullets dropping as items. I'm glad the two aren't compatible. Their obvious use is to move liquids (Both from place to place and manipulate them. Pipes are similar to Wood blocks in terms of placement, except that their ends can be modified if a pipe is placed perpendicularly and facing them. Right-clicking points at which pipe blocks meet, or would meet, cause them to connect and disconnect. I'm not sure what you meant by Wood Blocks, but I understand what you meant by how they are placed. If the input pipe block meets a paralell fluid flow, the fluid will be moved through the pipe at twice it's normal flow speed, coming out of the other end of the pipe. If there's multiple ends, it will distribute the flowing blocks among them (Example: A lava source block connected to 3 pipe ends will produce 3 Flowing Lava blocks, all of which will act as if they were 2 blocks away from their source block), with the "equivalent distance" being X/Y, with X being the distance the flowing fluid block would be from it's source at the input pipe's position, and Y being the number of output pipes. Flow strength isn't lost in pipes. Fluids cannot move vertically upwards, and will prefer to flow vertically downwards over flowing horizontally. I dunno where I'd find this useful, but it's good to have consistency. I don't think the idea of activating it with redstone is very intuitive. I feel like it'd be hard to figure out on your own that powering a pipe would do something useful. Seems okay. Can they be toggled with redstone though? This is a pretty straightforward one. Right-clicking a Pipe with Redstone Dust turns it into a "Sheathed Redstone Wire", or SRW for short. SRWs use a 3D model with points in the sides showing it's Redstone charge. Unlike Redstone Wire, they can be waterlogged and contact fluids without any trouble, making them basically waterproof Redstone Wire. Another trait they have is that they can be limitlessly placed vertically, thus avoiding the unsightly redstone staircases (Apart from platforms for repeaters) and saving horizontal space. They have to directly face Redstone mechanisms in order to interact with them. Their main catch is that they can only directly interact with other Redstone items if they're directly facing them similarly to Repeaters. I like the idea of not having to make unsightly redstone staircases ever again as well as the ability to place wire that can't be destroyed by water. Any effects that were previously applied BEFORE applying Inversion WILL BE modified (So be careful to use them, lest you turn an Enchanted Golden Apple into something worse than a Pufferfish). It's worth noting that Enchanted Golden Apples are specifically provided a new potion effect that shields their other effects from this effect (After all, wasting your Enchanted Golden Apple in SMP thanks to a common ore would probably produce a continent's worth of salt). Another notable exception is Bad Omen, which isn't reversed. Seems like an incredibly useful effect as well as a pretty overpowered one. I think there should be some ways to counter this. For example, regular golden apples might be able to shield from this effect as well, or in splash potion form, the potion only inverts one effect at a time. Seems interesting, though I'm confused why this happens if you add lead into something you drink. I think a better idea would be if the strength and length of the original effect was extended, but a negative complimentary effect was added to the potion with 25% of the duration of the normal potion. This would be more fitting because lead is poisonous. Some of these could use better names considering Depower isn't a word, but I see some potential in these effects. Those are 2 different effects... but ok. I like the idea of having a blast-proof block that is movable, although I think the way sound is currently done would have to be rewritten in order to implement the second one. I think I'll have to modify darts quite a bit, particularly as, while I have a clear role for them as a thrown weapon that provides much more mobility at the cost of range than other ranged weapons, I don't quite know how to balance it well. I think I'll have to make them deal less damage, but remove the cooldown and make them cheaper, and even then I can't really tell how to get them at less cost than 1 Lead Nugget while still keeping them able to be recycled. Then again, I could just make them sold by Fletchers as well, or decrease their fire rate, as it does make sense for them to be more hurtful than normal bows due to being more expensive than arrows, but that is offset by not being enchantable. As for the Sling's Power enchantment, all I did was change the formula so the increase is [Damage/2]* (Level+1), rather than [Damage/4]*(Level+1), so with 20 damage, the damage increase at power V would be 60 damage (With the total damage being 80, so it still falls short), which, while still brutal, means that I'll have to fix up the OP and note the actual maximum damage, on top of reducing the spinup time to 4 seconds. And renaming, as I plan on making it increase the actual speed. As for making Void Bullet a treasure enchantment, yes, I think I'll do. As for Shatter, I could give it levels, and make the transferred overkill damage increase with the levels, so only an endgame sling can actually transfer all the overkill damage. What you have to power with Redstone in order to drain liquids is the pump block, not the pipes. A way to nerf Inversion would be to make it last a short time, so you have to use the potion if you're anticipating receiving a potion effect, and making inverted effects stay, as a second inversion potion would put them back to their original effects. As for the other use of lead in potions, take into account that brewing is already full of things that most likely aren't safe to consume. The clarified flow strength mechanics (where pipes give only a single 'free' block of flow at entrance and exit) makes pipes considerably less useful, but is much more in keeping with established MC 'physics'. Comparator output from pipes: You've not mentioned how you wish to handle empty pipes [suggest zero output for both], full pipes (ie containing source blocks, assuming that is possible although disallowing this has advantages) [there are only 7 even numbers avilable], or how lava in pipes in the nether would be read [suggest as water in overworld for simplicity]. Making it possible for a comparator to (inferentially) detect the contents of a pipe is interesting: what use can be made of it is not yet clear to me, but new RS toys have a tendency to lead to new fun. The 'jogs' required for vertical SRW would only be for longer runs and would indeed be preferable to dry torch-towers/RDS stairways and a welcome alternative to S-piston_SlimeBlock_RSBlock transmision. I always liked the ideas of dart. With the drawbacks, they don't seem overpowered at all. Support. These mobs already have the individual functions. A new individual mob seem necessary. Get rid of the 2 string at the bottom and have 1 string in the bottom middle. Sounds a bit overpowered if they are able to 1 hit kill mobs without enchants. Water would need to be made nonrenewable for this to have utility. Support. Would mining fatigue be converted into haste. If so, when the guardian re-applies the mining fatigue affect, will the mining fatigue be neutralized? Status effects remain inverted even after the Inversion effect has worn off, and the potion's base duration if just 10 seconds. Base Ingredient: Lead Nuggets will, if added to a potion that already has effects, enhace them by adding a secondary Potion Effect that complements the original potion effect's. For instance, Potions of Slow Fall will also gain a Levitation effect, and Water Breathing also gains Night Vision. It's worth noting that, in most, the duration of the original effect is now split between both, with exceptions such as Slow Falling, in which the initial effect doesn't lose duration, but the secondary effect still has 50% of the original's duration. Sounds a bit weird tbh. This would indeed be a great feature! Players should also be able to craft a remote. When right clicked, it does the same thing as the radio emitter. that greatly differ from the usual "give me emerald pickaxes"
It is sad to see someone put so much effort into a great idea that will "Most Probably" never be implemented by Mojang. Someone please make a mod from this idea. I could do a new mob for the Slingers, but they'd have to be part of a separate idea. Mass has the problem that it has to have a very high damage in order for it's effect to be noticeable, as there's very few common hostile mobs that don't have 20 health (Namely, Spiders and Cave Spiders, Illagers, Ravagers, Guardians, and both the Wither and Ender Dragon, of which only Spiders are common and found on land), and the few ones have much more, or are underwater. Moving water isn't it's only use. It can also be used to drain large amounts of both water and lava, move items, and to control the flow. Then again, I'll also have to add another use to pumping water source blocks around, as too many of the uses of piping don't call for pumps to be used. Lead Golems don't use slings. They merely have a really big arm they use to throw projectiles as if it were a sling. As for it being too similar to iron, I have to agree, but the game has already made in-world building of golems the standard way, and there's a "limit" on how complex building a golem can really be. Then again, the shape could be better.